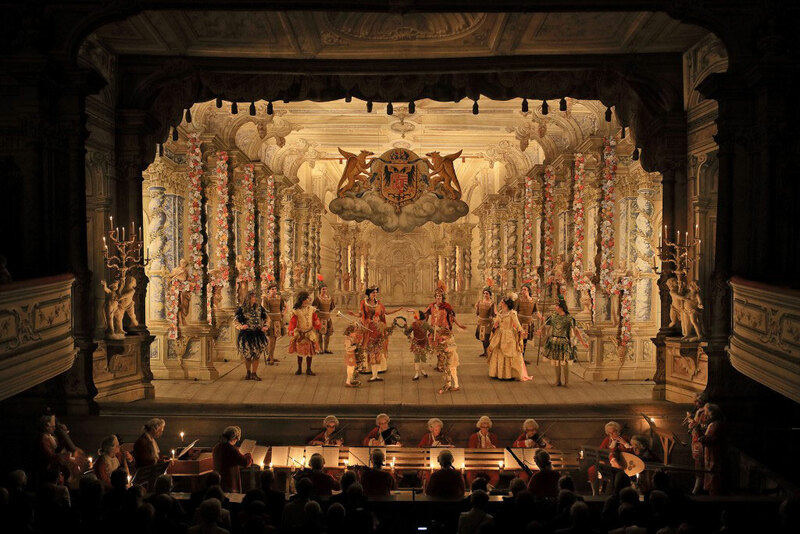 The seventh Festival of Baroque Arts in Česky Krumlov (Bohemia) took place from 19-21 September 2014. It included several chamber concerts, a Latin play of 1656, a Baroque fireworks display and Johann Adolf Hasse’s 1744 opera, l’Ipermestra, with a libretto by Pietro Metastasio. l’Ipermestra was written and first performed on the occasion of the marriage of Archduchess Maria Anna, the sister of Empress Maria Theresia, to Prince Karl Alexander of Lorraine, the brother of Maria Theresia’s husband, Archduke Franz Stephan. The première took place on January 8th 1744 at the Vienna Hoftheater, then already a public theatre but not yet renamed Burgtheater, and continued to run there during the carnival season. The royal family attended the third performance. Details can be found in Wienerisches Diarium no. 10 of February 1st 1744, which is available online through the Österreichische Nationalbibliothek. The modern world premiere of l’Ipermestra took place on 19 September 2014 at the unique Česky Krumlov Castle Theatre, first built in 1680-82 and reconstructed with new machinery in 1765-66. This machinery and the scenery are still in use, be it sparingly. The castle and the theatre, in the fifth courtyard, stand high above the town on solid rock. The construction of a spacious area under the stage was necessary for machinists, their scene-changing equipment and actors or singers using the lifts to appear suddenly from under the stage. The stage itself therefore is well above ground level. Instead of raising the auditorium floor, the audience was seated on high backless benches to which one must clamber up. Although the theatre has the customary wall sconces for candles these were not in use, making the climb in darkness even more difficult. As the theatre is of course not heated, blankets were available. Lighting is provided on stage by footlights, which cast dark shadows under the eyes of the singers, by lights hidden in the wings and between the borders above. Nowadays this lighting is low-intensity electric, for obvious reasons. It’s amazing how easily one’s eyes adjust to scant lighting, although the audience’s initial propensity for flashbulb photography was unhelpful. The request not to take pictures during the performance was honoured, however. The audience was also completely silent and attentive during the almost four-hour performance (with two short intermissions) on the increasingly hard benches, except for applause after each aria. Nobody coughed, moved around or otherwise disturbed others. The production’s orchestra was formed in Prague in 1991 under the name Capella Academica, now Hof-Musici (court musicians), and has been the resident ensemble at the festival since 2008. For this opera the group consisted of ten string players, three woodwinds, two brass players (natural horns) and a lutenist/guitar player, conducted from the harpsichord by Ondřej Macek. The orchestra were seated across from one another at a long double music stand facing the stage and the audience. The continuo was at the left of the audience, the brass and lute at the far right, with the rest of the players between them. Just before the overture a lighted candle was brought in, from which the players in turn lit their own; a procedure repeated after each intermission. Initially, the ensemble was not quite together, but once the curtain had risen it improved markedly. The vocalists were solidly supported and when there was an incidental hesitation, it was a singer’s. Hasse’s music lacks the genius of his contemporaries Mozart and Haydn. There are many similar passages. It does however give the singers every chance to demonstrate their virtuosity. The story takes place long ago and far away, thus conforming to a major condition for credibility: distance. Projecting it into our times, the favourite ploy of modern stage directors, would render it ridiculous. The usual situation, with a baroque orchestra in the pit and a plot ripped out of context, was happily spared us, thanks to the director Zuzana Vrbová, which is why we went in the first place. The plot follows Metastasio’s usual formula. With a few exceptions, each scene has a recitative, usually secco, followed by an aria and ending in the singer’s exit. The cast was strong and all the soloists treated us to seemingly effortless ornamentations in the da capos. In the various Greek versions of the story, there is a quarrel between the (twin) brothers Danaus and Aegyptus, the first of whom has fifty daughters and the second fifty sons. Aegyptus wants all the sons to marry all the daughters, but Danaus and his girls refuse and flee to Argos. Eventually they are forced to acquiesce, but Danaus commands his daughters to kill their husbands on the wedding night. They all do so except Hypermestra, who saves her Linceus. The sources vary after this, but none has a happy ending. Metastasio, who claims to have written his version in eighteen days, does away with all the characters but the three named, plus a wise advisor of Danao’s, Adrasto, and the secondary lovers, Elpinice, cousin and bosom friend to Ipermestra, and her beloved, Plistene, friend to Linceo. The nauseatingly moral Ipermestra refuses to kill Linceo but cannot go against her father to the extent of telling him about it so she simply rejects him. He is naturally beside himself and after numerous plots and ploys he and Plistene decide to kill the tyrant Danao, who is physically protected by Ipermestra from the man she loves because “he gave me life”. This noble behaviour opens Danao’s eyes to his own iniquity and he gives her his crown. Wedding bells. Why Metastasio, who was the court poet and a serious man of letters, felt that this tale was an appropriate way of marking the marriage of Maria Theresia’s sister to her husband’s brother eludes us. The soprano Jana Dvoráková seemed a bit aloof in her role as Ipermestra, which is of course fitting for a future queen but not helpful in transmitting the strong emotions she must convey. Bass-baritone Ivo Michi as Danao looked a little young to be believable as Ipermestra’s father. The castrato role of Prince Linceo was sung by mezzo-soprano Veronika Mrácková Fuciková, who might have moved in a more masculine manner. The role of Elpinice was taken by the soprano Olga Vit Krumpholzová and her lover Plistene by Pavel Valenta, tenor. Adrasto, Danao’s sly advisor, was well acted by baritone Zdeněk Kapl, of whom the audience showed its approval loudly. Both actors and orchestra members wore eighteenth-century costumes, mostly copies from the collection of 540 original pieces the theatre owns, but for the vocal soloists new costumes were made to order after authentic designs. Baroque gestures, all of which have a specific and easily understood meaning, were used throughout, which helped both the singers and the audience. The use of gesture was extensive, so the singers knew exactly what to do with their hands, and their movements supported and clarified the meaning of what they were singing. For a mainly non-Italian speaking audience this is most useful in following the text, as the theatre has no supertitle translations. The complete libretto, with translations into English, French and German, was handed out at the entrance and we saw many people outside reading attentively just before the curtain went up. It would be even better if it were available when buying tickets. As was customary in the baroque, others on stage held their poses while an aria was in progress. Far from being stiff and static, as modern critics who have probably never seen this done correctly aver, a picture was created and all attention was centred on the singer. We particularly admired the four small girls playing the pages, who posed as though born to this performance style. The theatre’s scenery was by the Viennese scene painters Johann Wetschel and Leo Markl, in the style of the famous Guiseppe Galli da Bibiena, who was at that time Maria Theresia’s primary theatre engineer and architect and thus responsible for the original 1744 scenery. The Česky Krumlov theatre has 250 wings, forty borders and eleven backdrops, from which thirteen standard scenes can be compiled. The perspective lines of the painting on the individual pieces were constructed in such a manner that the ideal point of view is about level with the balcony floor. Instead of taking the front balcony where the ruler sat as the point of departure, as was customary, a highly democratic effort was made to satisfy the audience on both levels equally. Therefore the perspective is not ideal wherever one is sitting, but the deviation is relatively small and not distracting. There were two intermissions between the three acts, so the whole event took almost four hours. To our surprise, the main curtain came down between the acts. During the second act there was another scene change, to a baroque garden; another well-known scene from the theatre’s stock. The change didn’t quite succeed: one of the wings didn’t appear. As a result we saw a lighting stand upstage left, which was meant to be hidden between the wings. Very authentic, that, for things regularly went wrong during early performances (Lafontaine has left us an interesting poem about it). It was also an instructive insight into the technique of theatre lighting. In the eighteenth century, the stands which now hold regular light bulbs and twelve years ago still had electric “Drottningholm candles”, held oil lamps, so the theatres were always a bit smoky. We can count ourselves lucky that electricity now reigns, as during the third act a lighting stand just behind the proscenium arch seems to have fallen over. In the olden days, that might have started a fire. The scenery in the first act was a hall in a palace: five pairs of wings with simple columns and a perspective backdrop suggesting a continuation of the hall. There was no sign of the festive decorations for the coming wedding as found in the stage directions. The garlands mentioned there didn’t appear until the last act, probably to avoid using too much “ammunition” in the first act. The scene change for the seventh scene takes one to another location inside the palace, a colonnaded hall, according to the stage directions in the libretto, with a view of the river Inachus and ruins of majestic structures. Most appropriately, the “Great baroque hall” scenery known from the many photographs was used; it has spiral columns and statues, all of course painted onto flat surfaces as was customary on the baroque stage. The backdrop had a few small waves but we had to imagine the rest for ourselves. The scene change took place with the curtain up, to which the audience responded with admiring murmurs and applause. The soloists had been getting applause after every aria but Plistene, who had just made a particularly beautiful effort, had to do without as everyone’s attention was focussed on the scene change. That nicely illustrated why musicians in the seventeenth and eighteenth centuries so often expressed their disapprobation regarding the great interest taken in the scenic effects. This performance gave them scant reason for complaint, however, as few of the spectacular effects this unique baroque theatre is capable of exhibiting were in evidence. No gods in machines, no supernatural occurrences. The story unfolds solely among the six main characters and in the palace or its garden. The scene in the garden included a fountain, a painted prop in which a continuous belt made of painted cloth has been inserted, which moves over rollers. The combination of painting and movement suggests falling water. In France at this time flakes of silver were being attached to the cloth to enhance the effect. In the third act we saw another scene change, now including the garlands adorning the palace hall, leading to the climax of the conflict and the happy ending. For the finale, a cloud descended from the heavens bearing the Habsburg coat of arms, flanked by heraldic creatures with considerable underbites. The opera ends with the invitation to Ipermestra, sung by all, to succeed her father and ascend the throne. l’Ipermestra was performed at the Festival of Baroque Arts in Český Krumlov from the 19th to the 21st September 2014. Image © Libor Svacek, Festival of Baroque Arts, 2014.